Just when you think there can't possibly be more hidden gems stashed in barns and garages around the world, something amazing pops up as if to say, "you ain't seen nothing yet." 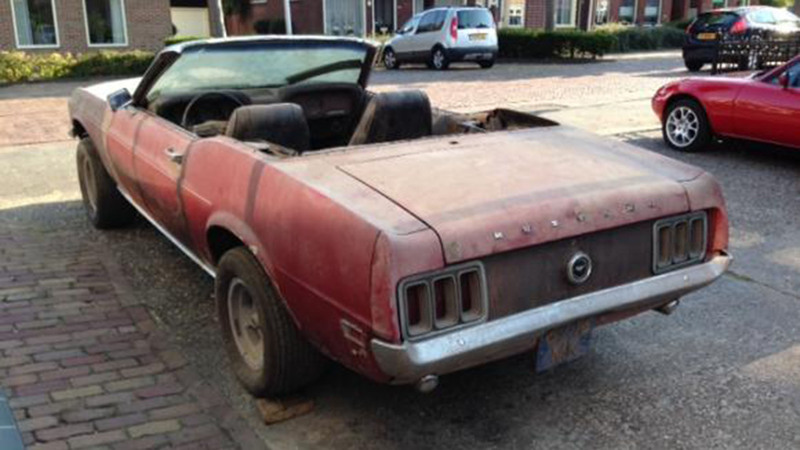 So while the 1970 Ford Mustang featured here for sale may not have starred in any famous movie chases, it still has pretty remarkable secret up its sleeve—"factory" all-wheel-drive, making it quite possibly the only droptop 'Stang so equipped in existence today. 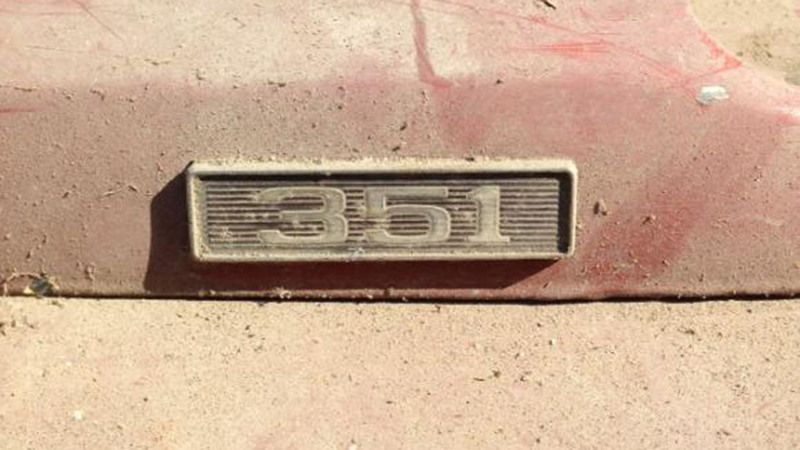 It's in rough shape after sitting in a barn for decades, but can you really put a price on a piece of pony car history? If you're confused right now—there's no such thing as a factory AWD Mustang, right?—it's worth revisiting an important but largely-unknown chapter in the model's history. The Mustang became an overnight success after its launch in 1964, and Ford engineers had to figure out how to keep that momentum going with fresh ideas to expand the line. Meanwhile, a small British company called Ferguson Research had spun out of tractor manufacturer Massey Ferguson a decade prior with the goal of designing the first full-time AWD system for road and race cars. So in December of 1964, Ford shipped a couple of notchback Mustangs over to England to see if Ferguson's technicians could put it all together and create the world's first AWD pony car. The "Ferguson Formula" system was pretty crude compared to today's computer-driven wizardry, with a planetary center differential and a chain-driven front shaft creating a 37:63 front-to-rear torque split. The cars also gained the company's experimental Maxaret anti-skid braking setup, a mechanical forerunner to the ABS of today. Though performance and handling were greatly improved—Classic Cars got ahold of one for a driving review in 2000 and compared its sure-footedness in the corners to an Audi Quattro—the modifications required to make everything fit were just too expensive and Ford ultimately decided not to pursue the partnership or develop an AWD system of their own. However, Ferguson continued to test their technology on a whole range of cars, including more Mustangs, and the system later found its way into the Jensen FF, the first production car offered with AWD. And here's where things get murky—officially, there are those two prototypes, plus a couple 1969 fastbacks, including one built for a Ferguson executive with the 428 7-liter V8 that survives in showroom condition today. So where does this convertible fit in? 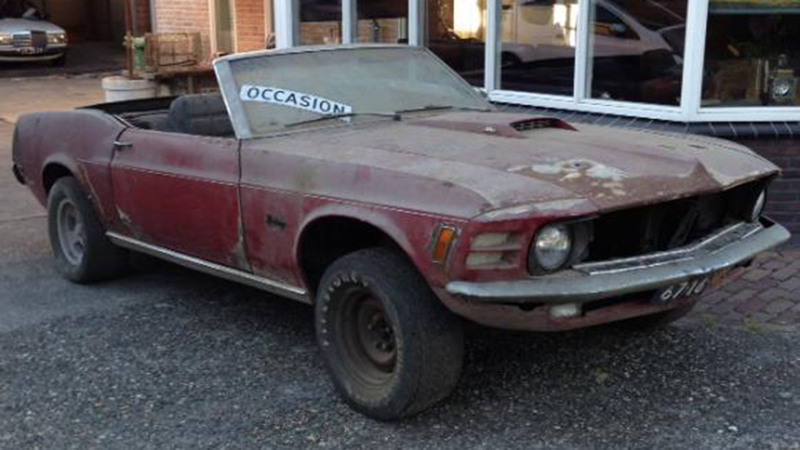 Being a 1970, it would have been for a private customer, not part of the Ford partnership, and appears to be the only droptop converted to AWD. It's hard to know for sure without an official build count or seeing it in person, but it would be pretty hard to fake one of these. With all that in mind, its frankly terrible condition after spending decades in a Dutch barn is all the more heartbreaking. The high-riding front end plus a poor internet translation of the listing seem to indicate both the engine and front drive unit are missing, and tracking down those parts or a wrecked Jensen FF to source from would be a tall order. Then there's the omimous "Ask" price. We know what that usually means... but still, we hope someone finds the time and resources to rescue and restore one of the world's most unique Mustangs.